"Target the causes of oily skin as you sleep with the purifying Vichy Normaderm Night Detox moisturiser. Normaderm Night Detox is ideal for both teenagers and adults whose skin produces too much sebum over night, which can lead to blemishes and greasiness. Designed to regulate your complexion during these crucial twilight hours, the lightweight fluid offers oil-free, targeted care that’s even suitable for sensitive skin. The supercharged formula tightens pores, evens the skin’s texture, reduces imperfections and enhances radiance for clear and purified skin upon waking. Though powerful and effective, Normaderm Night Detox is kind to the skin, with an infusion of Vichy’s famously soothing thermal spa water." Now I should state that I have only been using this a week so obviously I will follow up with a full review say in two months? But so far so good! The texture is light and more akin to a lotion than a night cream. On the skin to feels light, silky, cooling and hydrating yet not heavy in the slightest. A week is nowhere near long enough to say if a product is working or not but what makes this so promising is the recent balmy weather. When it becomes humid, it is difficult to sleep and wither you care to admit it or not we sweat in our sleep which includes the face and if you have oily skin the heat can often make oil production more intense. Normally when we have warm weather I am guaranteed a break out, a lovely cluster of blemishes on my forehead and cheeks. Like I said lovely! Yet this hasn't happened this week? How very odd! The only new product to my routine has been Vichy Normaderm Night Detox so I think it could very well be down to this. You can find it here - link. Blemishes, enlarged pores, shine prone skin, oily skin, imperfection marks and a generally irregular complexion? Sound familiar? Well Vichy Normaderm Global Anti-Imperfection Hydrating Care could be the moisturiser you need. Again I have only been using this for a week so I haven't reaped all the benefits just yet but despite being rather humid I haven't been as oily or shiny as normal. 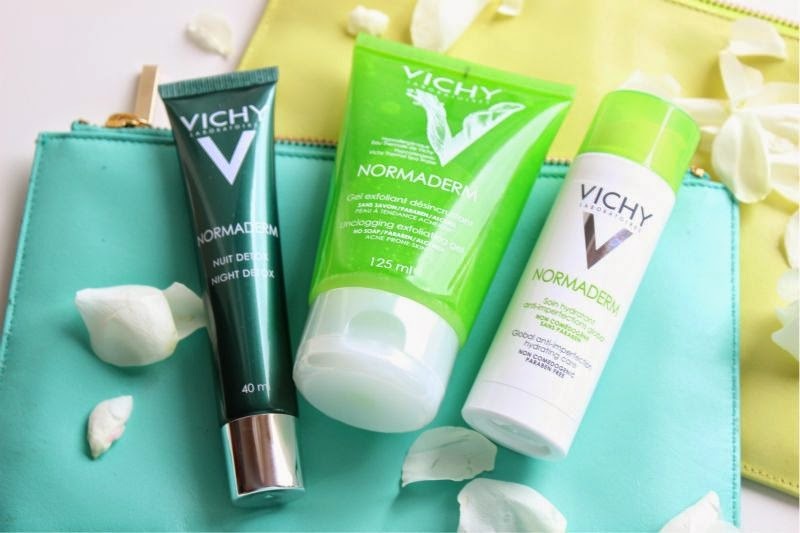 Basically Vichy Normaderm Global Anti-Imperfection Hydrating Care is a light, non-greasy, oil free daily moisturiser (it contains no SPF). It hydrates gently but doesn't overwhelm oily skin types and is perfect for under make-up (it doesn't compromise the finish nor will it encourage make-up to slide off the face). So far I like it for the oil control aspect but I'm hoping with continued use my pores and blackheads will be a thing of the past. If it also helped to fade some scarring that would also be great. I shall keep you posted. You can find it here - link. I also have Vichy Normaderm Unclogging Exfoliating Gel which I haven't tried and won't be as it contains micro-beads to provide a "Mechanical" exfoliation. For personal reasons I am against said beads but being a Vichy product I can imagine that it will deliver. A very promising new range of products, I will keep you updated along the way!